KJB – King James Only? 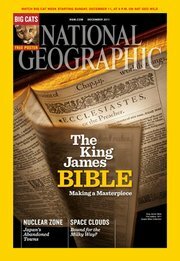 The latest issue of Christianity Today features a cover story on the influence of the King James Bible. 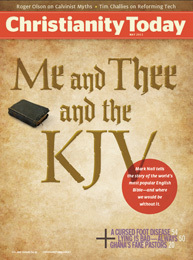 Mark Noll, the noted evangelical historian, authored the article entitled: “A World Without the King James Version: Where we would be without the most popular English Bible ever”. The article explores an interesting question. Along the way you will learn things you didn’t know about the KJV. Here’s an excerpt which reveals that the problem of multiple and competing Bible translations is no new problem. Be sure to read the entire article, and check out this interesting quiz. From about 1650 to 1960, when Protestants memorized the Twenty-third Psalm, they would always recite the last verse this way: “Surely goodness and mercy shall follow me all the days of my life: and I will dwell in the house of the Lord for ever.” But if the KJV had not become the favored translation, the memorized words would have depended on translation preference. 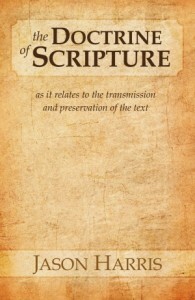 Of course, Protestants would have continued memorizing Scripture even with several popular translations in existence. But they would have done so privately, sincepublic recitation with several translations could be haphazard—much like it is today. And we would have lost some small sense of connectedness in the church and the broader culture.